Most higher end tripod come with a 3/8″ screw hole at the bottom of each leg that can accept any type of foot with the same thread. This enables the user to swap out the feet depending on the type of surface the tripod is to be used on. In this post, I am going to look at the stiffness and damping of a couple tripods while swapping out various feet. This particular test is being carried out on a concrete slab floor, covered with an epoxy coating. This is a very firm surface, and I suspect the results should applicable to most types of hard flooring, concrete, pavement, or rock. I tested two tripods, a Really Right Stuff TVC-33 and a Gitzo GT2542 Mountaineer. For each tripod, I tested the axial (horizontal motion) stiffness and damping with five different sets of feet. 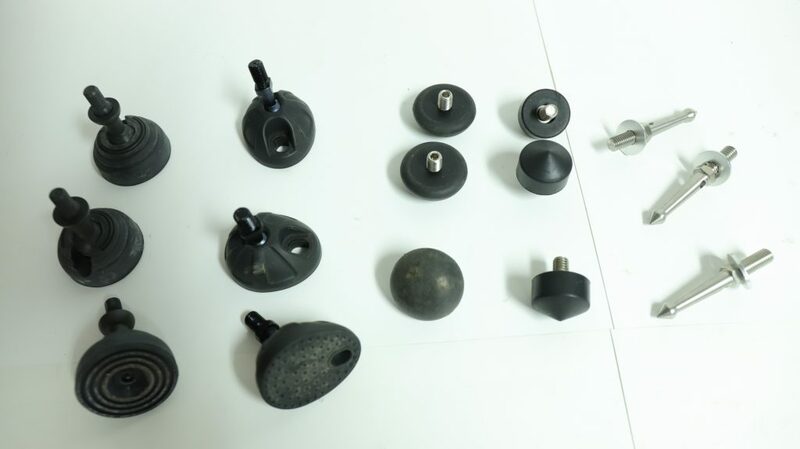 These are shown in the image below from left to right as, Gitzo Platform Feet, Induro Platform Feet, Really Right Stuff Rubber Teardrop Feet, Gitzo Rubber Feet, and Spiked Feet. I am using the term “Platform Feet”, as I don’t have better way to distinguish between feet that have a ball mount and flat rubber bottom, and the feet that are just rubber nubs. Elsewhere on the internet, they seem to both be called “Rubber Feet”. For each tripod and foot, I took five measurements of the stiffness and damping, and am reporting the average and standard error from these measurements here. I am only reporting the axial (horizontal motions) stiffness and damping here, as it is the weakest and therefore most important axis. There are small but noticeable differences between the types of feet. The relative performances of the feet in the two different tripods were very similar, so I didn’t feel the need to try this on more tripods. The spike feet performed the worst, but not by much. But no one ever wanted to use spiked feet on hard surfaces to begin with. They are strictly for outdoor use on soft surfaces. The two sets of rubber nub feet performed very similarly. These are standard on most tripods and are expected to be good all around performers. They performed slightly better on the hard surface than the spiked feet, though the margin isn’t as large as I expected. The platform feet provided a small but detectable increase in the overall stiffness of the system, and a respectable increase in the damping. The increase in damping could be very helpful when shooting with long lenses. The Gitzo version of these feet performed a little bit better on both stiffness and damping than the Induro ones. The results here are not particularly dramatic but consistent with what we could have guessed intuitively. Feet with more surface contact to the ground performed better. If you have the standard rubber nub feet I wouldn’t rush out to buy platforms. They are cumbersome to use in practice. If you are working on hard surfaces with longer telephoto lenses though, a set of platform feet may be for you. The increase in damping they provide is very helpful when dealing with the long vibration die down times that are caused by such heavy equipment. Thanks for doing the testing! arc of the leg movement. Mushroom Foot makes more sense. I was using “Teardrop Foot” since that’s the term RRS uses. deal with vibration on hard surfaces.